Get Witzworx, the Shareware Comic Book Font! Mister Ron's Basement is a daily podcast of funny stuff from the public domain. http://misterron.libsyn.com. And if you've already got the latest iTunes on your machine, then you can click here and iTunes will open up to Mister Ron's Basement! John Kelly, writer extraordinaire of the Washington Post, has written a fascinating piece about Mister Ron's Basement. Read it here. 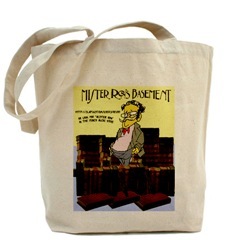 Mister Ron's Basement SWAG (Totebags, T-Shirts, Mugs, etc.) are currently not available, but will be again soon! http://ronevry.com. !